So….Guess what? I figured out my dissertation! Well, not really. Not the whole thing. But I finally feel like I have sort of the start of an idea of a plan. Yesterday I gave a talk at the Marine Mammal Institute Brownbag series at Hatfield Marine Science Center. I took this opportunity to try and sketch out what I will be focusing on the next few years. The problems you discuss seem similar to problems that were worked out for visual surveys in the past. That would be a great place to start in your literature search. Great point! That’s kind of what I was trying to convey…so yay! Well. If I’ve got one thing to say. It’s a lot. Again…I agree. I hadn’t realized how big it all seemed until I got it all out there. But it’s a highly collaborative project, so I think it will be doable? And I’m sure things will get tweaked. But I do need to be reasonable here. You really nerded out up there. Heck yes I did! 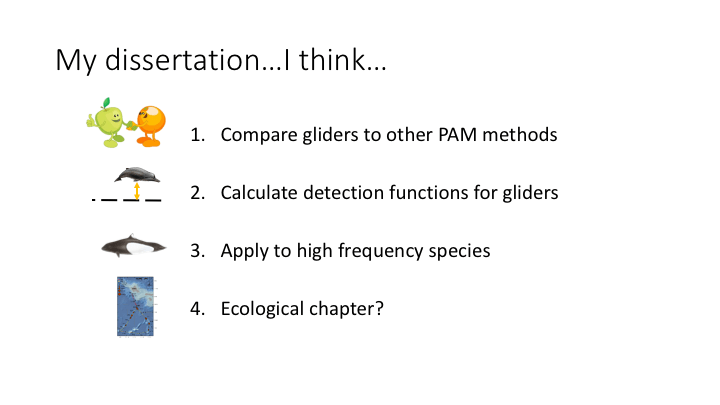 Gliders! Woo! **I paraphrased all of these so I won’t put the names of who they were from 🙂 I think I got the gist of what they meant? « It came…from the COMPUTER!!!!!! !